As a small business owner, you have a lot on your plate. You may even be handling every job there is to do concerning your product or service. A project manager could be just the person to help you elevate your business to the next level. Every business owner wants to grow. That is the goal of business. The desire and the reality are two different things however. As a small business owner, reaching the next level may require help. You have consistently showed growth and you have processes in place that work for your enterprise. Now, the need is for someone to manage it so you can handle the aspects that only you are qualified to do, like finding new business clients may arise. This is where a project manager comes in. What is a project? What is a project manager? Let’s talk about that. A project is any work that you do for a client. For example, if you are a landscaper, then a project could involve planting flowers, shrubs and trees for your customer. Using that same example, each client wants a plan for how the work will get done along with pricing and timetables. If you, as the business owner, went on every client call, you’d never find new clients. There just aren’t enough hours in the day. A project manager is the person who is hired to manage your business clients. They understand your business, how to create a vision for each client based on your business objectives, and how to create and implement a plan to complete each project. Project managers are found in a variety of industries. They may also go by other titles like project supervisor, manager or foreman, depending on the company. As the most senior high-level decision maker, all final decisions on client budgets and projects are at your discretion. 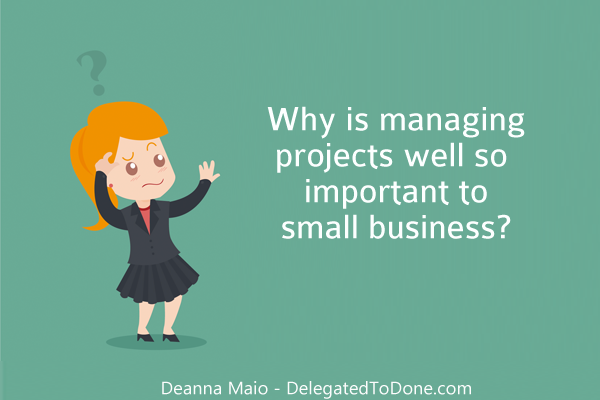 Project managers do need access to you at all times if they have questions or if you want to retain certain decision making powers for yourself. For everything else, they can become the client point of contact. Better morale – Team members and clients have someone readily available to answer their questions and give them feedback. This increases customer service satisfaction as well as team member morale. An advocate for your business – Their goal is the same as yours. They are committed to your vision by providing the customers with the services they need in a timely manner. Alleviate pressure on you, the business owner – Your time can be spent networking, finding new clients, working on advertising strategies and the like. The team can look to the project manager for their daily task assignments. Increased risk assessment – A project manager can pick up on potential problems and “scope creep” before it becomes an issue with a client project. Greater competitive edge – Any client will know that they get the benefit of the experience of a seasoned individual working for you to provide superior knowledge of the business and excellent service.